In mid-August, Prep Rally brought you the story of Brett Bowden, the inspiring Hobbton (N.C.) High football player with Down Syndrome who will be unable to suit up with his longtime varsity teammates during the 2011 season because he turned 19 before the school year began. 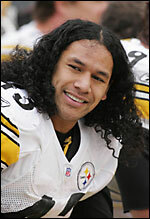 Well, now the young athlete's cause has gained a celebrity football backer: Steelers All-Pro linebacker Troy Polamalu. Shortly after Bowden's story became national news, someone sent Polamalu a link to the Facebook page entitled "Let Brett Bowden Play ", an online forum where more than 65,000 Facebook users have pressed "like" and commented in an effort to add public pressure to the North Carolina High School Athletic Association, which first ruled that Bowden couldn't dress with his teammates. "This young man Brett has Down Syndrome & because of his age is barred from High School fball.Plz like his Facebook page http://www.facebook.com/pages/Let-Brett-Bowden-Play/229211873780578"
While it's impossible to know how many more "likes" or fans Polamalu's Tweet helped Bowden gain, the linebacker's brief online missive was re-Tweeted by more than 100 people itself, which would lead one to believe it was read a fair share of times. That's not to mention the nearly 250,000 followers of Polamalu's personal account who would have seen the Tweet in their own Twitter feed as it went live. Of course, none of this has dramatically changed Bowden's core situation. The junior continues to attend Hobbton practices and games, even though he can't dress out in the team's full uniform. He will allegedly going to be able to participate in touchdown drills after the team's games during the forthcoming season, with the stipulation that those plays will have to be run after all competition has been completed. That being said, it never hurts to have celebrities backing one's cause, particularly when they are of the caliber -- both in terms of achievement and likable personality -- as Polamalu. Add to that the pro arena football offer which has already been extended to Bowden , and at least the teenager knows he has plenty of people behind him ... and options if he ever wants to try another level of football. That's more than you can say for a lot of football players around the country.